It’s interesting how a single event can shoot the gates up around our hearts instantaneously and the choice to play the old records in our minds shifts into automatic. Entire albums even. Over and over again. Stuck on repeat. We sometimes work really hard to throw out those old records, narratives, stories. . . convincing ourselves of their untruths and we attempt to rewrite new, more compassionate songs, in hopes to slowly allow the gates to be drawn in order to feel again. To love again. And, to live in peace. To open our hearts. However, when an event occurs that cause us to revert back to what we thought we released, we know there is more to unearth, more to learn about ourselves and who we are. More to grow and transform. We are never finished releasing. We all carry deep pain in our hearts and souls. All of us. 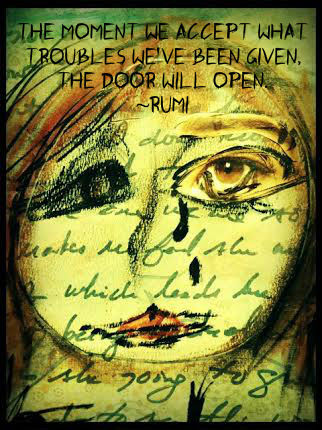 It’s an “Open Secret“, Rumi calls it. The human behaviors we display (and probably are not very fond of) are a result of that pain. The workaholic overworks because his father told him he’d never amount to anything. The alcoholic drinks to numb the pain carried from a high school coach who instilled the belief that he was just not good enough. A teenage girl exercises obsessively to block the pain of the words of a boyfriend that said she was gaining weight. An angry boss yells because in his childhood, he was expected to do things right and if not, punishment followed. Whatever the undesirable behavior is that we unconsciously display, it’s rooted from pain. We even tend to live out this story. These lies. The wonderful gift that we humans have been given that no other animal species has, is to be able to go back to that pain, feel it, acknowledge it, release it and then find a new truth. This is how we rewrite our stories. We can reopen our heart to others this way and change our behavior, rather than to live with a blocked heart, a stuck flow of energy. Long term, the energy patterns that cannot make it through you are pushed out of the forefront of the mind and held until you are prepared to release them. These energy patterns, which hold tremendous detail about the events associated with them, are real. They don’t just disappear. When you are unable to allow life’s events to pass through you, they stay inside and become a problem. These patterns may be held within you for a very long time. We are either trying to push the energy away because it bothers us or we are trying to cling to it because we like it. When you resist that release, the energy gets packed up and forced into deep storage within the heart. In the yogic tradition, this is called a Samskara. These Samskaras end up running your life. If they build up sufficiently, you will find yourself in a state of depression. Eventually, everything appears negative because the world of the senses must pass through this depressed energy before it gets to your consciousness. Even if we are not prone to depression, it builds up over time and gets blocked. This affects how we live. Singer shares, in his book, the process for releasing these blocks, or Samskaras. It’s quite amazing. Imagine these blocks in your heart as thorns. Visualize them penetrating your heart and protruding all the way to the outside of your body. They stick out. Whenever someone, something, or an event brushes up against a particular thorn, it hurts. That Samskara is being disturbed. You have a few choices when this happens. Well, first, you can prevent it from happening by avoiding any situation that might disturb the thorn. If we do this though, we are not living to the fullest. We are living in fear. What Singer suggests we do is to just be centered, conscious enough recognize when a thorn has been disturbed and just watch the stuff come up. Be aware of it. Accept it. And, then let it go. This sounds easier said than done. Just relax your heart, forgive, laugh, shift to gratefulness, do anything you want. Just don’t push it back down. It’s gonna probably hurt, but hopefully not for too long. And then, it’s over. You’ve let it pass through you. This process happens over and over all the time. The result is a constant open heart that allows the energy of love to flow . You live in love, and it feeds and strengthens you. This purification is a wonderful thing. It starts the moment you accept what troubles you’ve been given. Acceptance. Not resistance to them. It starts when we shift to gratitude rather than to dwell on the wrongness of a situation. There is a secret treasure that lies waiting for us at the bottom of our most difficult times. It starts when we recognize that everything that happens is not happening TO US. It’s just happening. It starts when we let go of the expectations of what we think our lives and others’ lives should go like. It’s a journey of a lifetime. What are your Samskaras? Can you let them go? Or, are you going to hang on to them for dear life. I love this post. Great insight and wisdom Shari. I must admit I have deep deep thorns – I don’t suffer from depression as a condition, but do get very down and my insecurities and fears do overwhelm me, life seems really overwhelming too. I hope though I can find my way through. Thanks for giving me hope. Those thorns can penetrate so deeply and gosh, they hurt. The suffering we cause ourselves because of the thoughts we continue to play over in our minds can be unbearable and take us to a dark place pretty fast. I hope you find peace in your journey, James. Everyone’s is different. I really resonate with your words here. We all build walls around our hearts. It’s easier to forgive or release those pains and burdens, but to trust again and TRULY give them up is totally different. Great post and words of wisdom. I love that concept from Rumi. Thank you, Kayla. Those walls are only hurting ourselves from living a life of meaning and joy. It’s hard enough when we have them ourselves. It’s worse when we see others’ hearts this way.